All you need is a comb, a straightener to give your pony some texture (this one is my fave), some bobby pins, 3 clear elastics, and some medium-hold hairspray (this is the one Aylin swears by). 1. Part your hair right at the centre. 2. 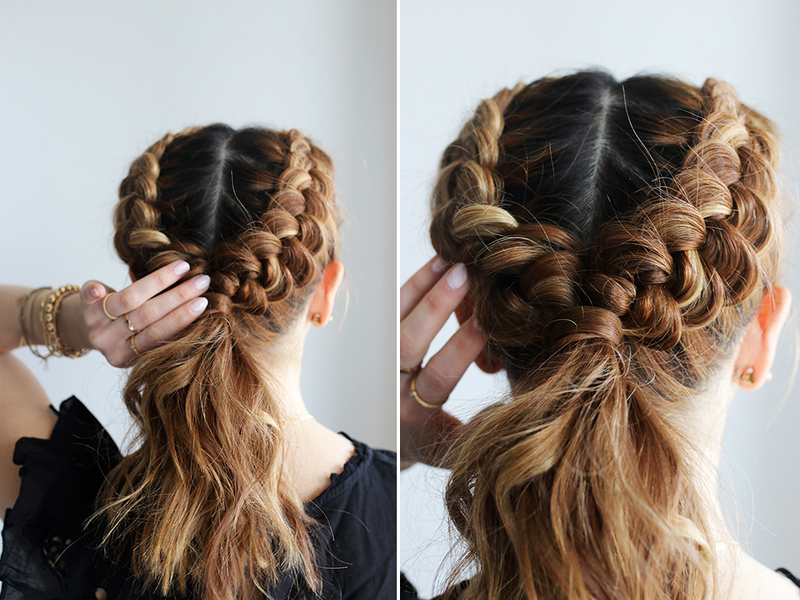 Grab one section and dutch-braid it by crossing the strands of hair under rather than over (that’s how it pops out!). Make sure you incorporate hair to the strands as you braid it. 3. Work towards the back of your head and once you reach the nape of your neck tie it with a clear elastic. 4. Repeat on other side. 5. Once you have both braids done, join them at the centre and tie them together with a clear elastic. 6. Take a small section from the ponytail to cover the elastic by wrapping it over and securing it with a bobby pin. 8. Gently pull out the braids for a fuller, thicker look. 9. Set the style with some hairspray and you’re done! Great Finds File: Black Friday Sales!! !